How would you like to meet former Angel & pre-game & post-game Analyst Tim Salmon? Join Angels Radio AM 830 and the Strike Force Girls at Cox Solutions for lots of great giveaways and to meet Tim, today, July 5, 2014, at 12 noon. 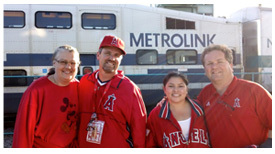 Come join the Orange County Transportation Authority for an Angels Express Fan Friday celebration at the Irvine Metrolink Station on Friday, April 11 at 5:00 PM. Be one of the first 100 people and take the Angels Express for FREE! Enjoy FREE food and live music. For more information, please click here. The OC Zoo is offering free admission and an opportunity for children to take photos with Angels catcher Hank Conger on Saturday, Sept. 7 at the zoo, 1 Irvine Park Road.